This was shown on TV- it was this or 'Taking Lives' but that was on later and I needed to sleep early-ish so I went for this and I was pleasantly surprised at how enjoyable it was. Jane (Katherine Heigl) is always the bridesmaid, never the bride. One time, when she has to attend two weddings in one night, she bumps into writer Kevin (James Marsden) who is fascinated by her and decides to write a story on her, despite having feelings for her. When her sister Tess (Malin Akerman) comes into town, she meets Jane's boss George (Edward Burns) and lies about herself in order to get closer to him, unbeknown to the fact that Jane has been forever secretly in love with George. Their quick love accelerates and they decide to get married in three weeks with Jane to help her every step of the way. As Tess steals Jane's crush and her dream wedding, Jane is pushed to new lengths. Will she be able to go through with it and be the perfect bridesmaid? Despite all these "seen-before" elements, this film is surprisingly enjoyable and humourous. There were several scenes where I truly laughed out loud. One particular line I remember deeply having laughed is when Tess yells at Jane "You might want to alert traffic control because Bridezilla's on the loose!" The film is well paced and builds up to a climatic and explosive reveal which then follows with an appropriate and feel-good catharsis and a humourous ending which finishes off the film superbly. Katherine Heigl is a stand out in this movie- her expressions and movements felt genuine and truly like her heart was being trampled on in certain scenes. Everyone else did well, but did not shine like she did. 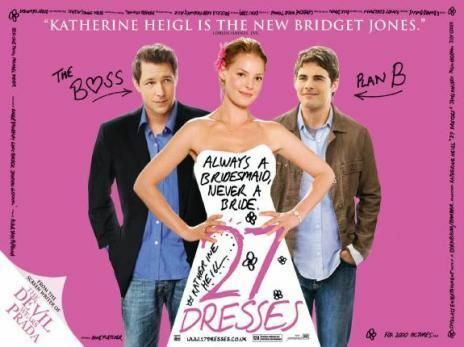 27 dresses is a surprisingly enjoyable movie which feature all well known rom-com elements but puts it in a refreshing way. Katherine Heigl is a star in this movie but the other cast delivers humourous moments too which make you laugh out loud. The overall effect of this film is a 'feel good' rom com and definitely has widespread appeal. See for yourself!